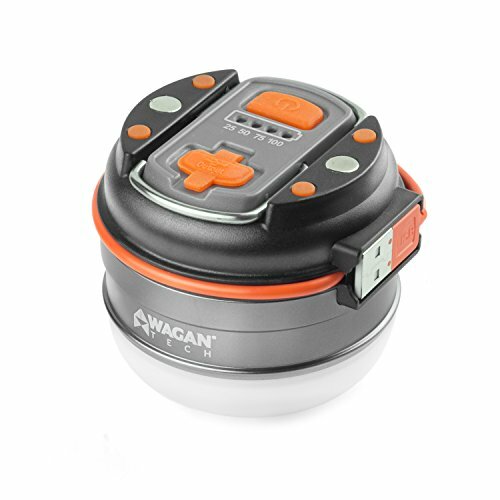 Utilizing a rechargeable li-poly battery, the 220-lumen brite-nite dome USB lantern from wagan is ideal for camping, hiking, emergencies, power outages and other nighttime outdoor activities. It can also recharge your USB-powered devices with its built-in power bank. With the powerful magnets, hanging hooks, rubber ant Islip feet, 3 lighting modes and multifunction design, the brite-nite USB lantern will make your next camping trip conveniently bright while keeping your devices fully charged. BRIGHT & COMPACT: Easily switch between 220 Lm (high) and 110 Lm (low) by pressing the single button. Pocket size design is ideal for kids and outdoor carrying. Multi-Purposes: It is the best lightning option for our door activities such as, camping, fishing, hiking. It is also a good emergency lighting for power outage. If you have any questions about this product by Wagan, contact us by completing and submitting the form below. If you are looking for a specif part number, please include it with your message.